Best Aerobic stepper is exercise equipment that is used to perform the step aerobics that is a classic cardio workout. This workout helps you to gain the positive results in weight loss and toned muscles. It’s a very old workout type and lasted for decades for a simple reason: It delivers results. Generally the “step” is a 4-inch to 12-inch raised platform on which you step up and down from the platform. You can perform different workout patterns to enhance your heart rate and breathing, and fortify your muscles. When you are eager to workout daily at home but you are limited to space at home. To overcome this and achieve a great fitness hours at home itself “Aerobic Stepper” is best option for you. It doesn’t take much space for storage or workout. Almost every stepper is compact, portable and easy to use. They’re small enough to use anywhere and can deliver a cardio, strength, muscle building, aerobic or calorie burning workout in the comfort of your own home or office. Use an aerobic stepper and take your exercise sessions to a whole new level. Step up and down from the platform in different patterns to boost your heart rate and breathing, and strengthen your muscles. The most basic is a step-up, step-down. Once you get more experienced, you do moves that take you over the top and around the step forwards, sideways, and backwards. To perform the workout at lowest intensity, put the step flat on the floor and to make it more intense, add risers that raise the step’s height. Muscles: Your muscles become stronger and more shock absorbent. You will achieve toned muscles once started doing aerobic stepper exercise. Arms: Generally stepper is mostly used to tone the lower body but you can also use it to strengthen arms with a proper workout training specifically designed for arms. Legs: Stepping up and down works your calves, quadriceps, and hamstrings that result into stronger legs. Glutes: All those step-ups strengthen and tone your buttocks. It gives you perfectly shaped body. Back: Each step on the stepper will also help you to strengthen your back muscles. The fluid motions of stepping will improve your flexibility. With each step your heart will pump harder resulting in good blood circulation. As you will sweat out you will burn more calories. Stepping up and down works the muscles in your calves, legs, and buttocks. Many step aerobics classes add strength-training with weights. If you’re an athlete, you might use step aerobics to cross train. You usually keep one foot on the bench or ground, so step aerobics can be a low-impact program. Regular aerobic step exercise releases endorphins in the body; reducing stress, anxiety, and symptoms of depression. Three intensity levels of aerobic stepper exerciser can be used as per the age and body condition. Aerobic exercise helps individuals manage stress, maintain and lose weight, stimulate the immune system, and reduce the risk for certain preventable diseases. Aerobic exercise works to benefit the body by burning off additional calories that are not used by essential functions of the body. Any calories consumed beyond requirements are simply stored in the body as a fat and aerobic stepper helps to burn out those calories and make you healthier. The increased circulation while exercising also acts to bring a fresh supply of oxygen to the brain. Now you have the idea about how an aerobic stepper works and what are its benefits. Below we have shortlisted some of the best aerobic stepper from the market that are good and result oriented. Enjoy your aerobic exercise experience by selecting any of the below aerobic stepper. Great for workout classes and regular home use. This 31” exercise stepper is beneficial to improve your cardiovascular fitness. The secure and non-slip surface can ensure you exercise easily and safely. This aerobic step targets your hamstrings with alternating lunges and also helps you to strengthen your chest and back by pushups. Ideal for cardio workout or to strengthen your lower body. Performing choreographed movements on an elevated platform to drill your upper and lower body and cardiovascular system. It will help you get the most effective results you want. Convenient to store, the stepper with its adjustable risers is sure to shred your pounds and get you the perfect physique. Improve cardiovascular health, increase stamina, and tone muscles by using the Tone Fitness Aerobic Stepper. Nonskid Feet: Prevents platform from sliding or scratching floors. Grooved Top: Extra grip for added safety. The aerobic step can be used to shape your hamstrings with alternating lunges and strengthen your chest and back muscle by doing pushups. It supports up to 500 pounds weight. 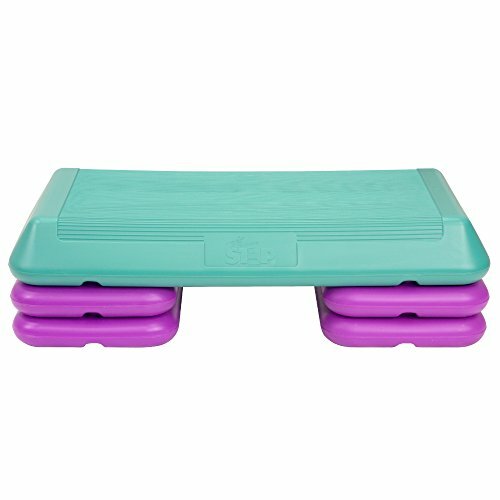 It is Lightweight with the non-slip & non-stick surface and shock absorbing design makes platform safer and easier for you to move. It offers you 100% risk-free satisfaction guarantee to let you buy with confidence. 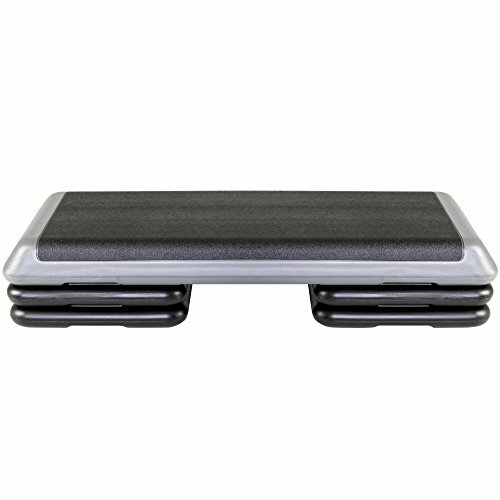 This adjustable aerobic stepper will help you work on your coordination as you improve your cardiovascular fitness. The aerobic step can be used to target your hamstrings with alternating lunges and also help you to strengthen your chest and back by pushups. Made of high density ABS material. Three settings of adjustable height (4”, 6”, and 8”) are available. Adjustable to three different heights; 5.9 in, 7.87 in and 9.8 in. Dimensions: 40 (L) x 15.2 (W) x 9.8 (H) in. Simple click and lock feet adjustment. Maximum weights limit 242 lbs. HIGH-DENSITY POLYETHYLENE MATERIAL: Constructed of recyclable high-quality polyethylene. Maximum weight capacity is 200 pounds. 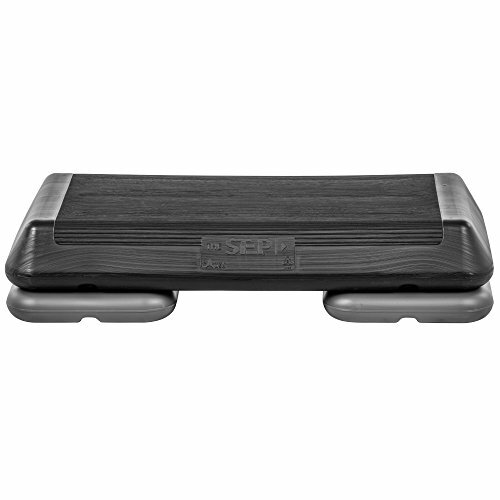 VERSATILE STEPPER PLATFORM: Ideal for cardio workout, fitness, low & high-impact.